Keri Belle is running August 22nd in a maiden special weight for fillies and mares 3 year old and upward going 6 1/2 furlongs at Saratoga. She will be ridden by Junior Alvarado. She is trained by John Sherriffs and owned and bred by the Mosses. 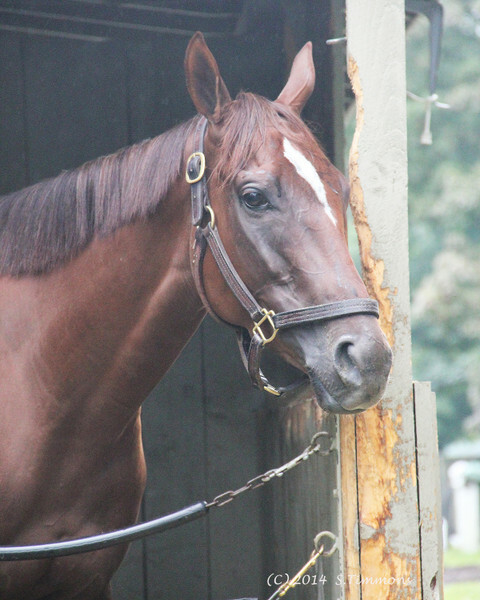 Stanwyck is running August 22nd in the Personal Ensign Stakes. She will be ridden by Rajiv Maragh. She is trained by John Sherriffs and owned and bred by the Mosses. Post positions for Saturdays Traver's Stakes at Saratoga-I'll be there! 8 Kid Cruz [ML 12-1] – Linda Rice – Irad Ortiz Jr. Thanks so much for posting all of your fabulous photos! I enjoy looking at them so much! 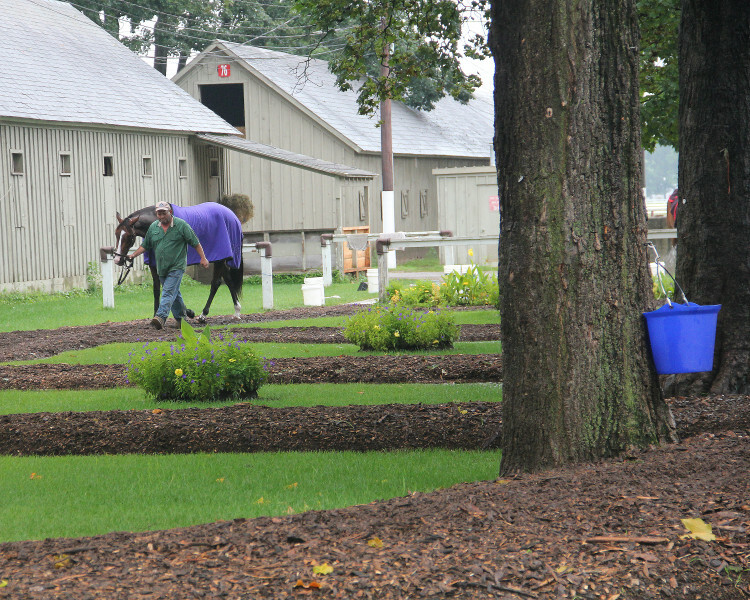 I've been taking different tours at Saratoga for the past couple of summers. I haven’t been home a lot-but when I am, I try to fit in as many trips to Saratoga as I can. (10 trips over so far!) Today I had signed up for the Oklahoma Training Track tour through the National Museum of Horse Racing. It poured on the drive over, (1 & 1/2 hours) but it stopped long enough for a nice tour. There were only 2 of us, probably due to the weather, which worked out well. I’ve been back by some of the barns before, but saw many more today. 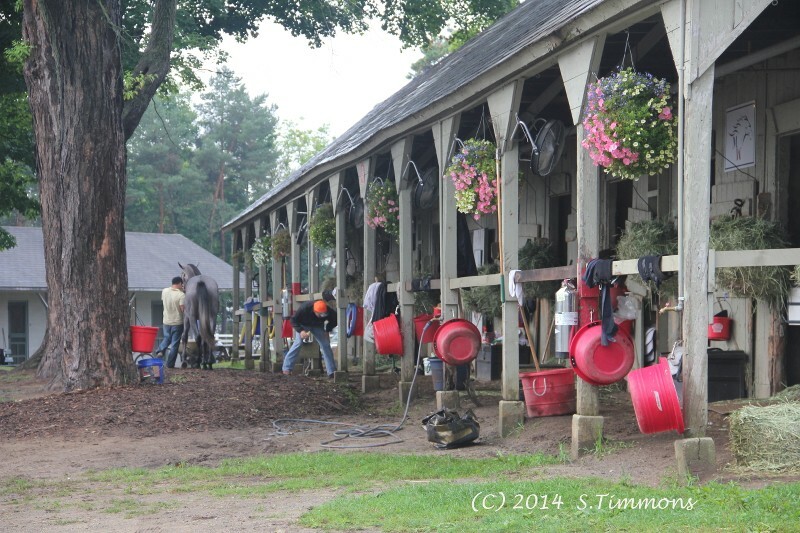 (We saw, Lukas’, Pletcher’s, Contessa’s, Zito’s, Mott’s, Trombetta’s, Cannizzo’s, O’Brian’s, Sciacca’s, Pugh’s etc.) The Phipps barn has the most beautiful grass area of them all. I wasn’t able to take many photos, as our guide kept us moving, but I did find a broken horseshoe back by an old blacksmith shed! Next weekend I’m scheduled for a photographers tour of the same area, so hopefully will get to stop more frequently for photos. John Shirreff’s barn is back there, but when we went by, I didn’t catch another glimpse of Coz :0( Hoping for better luck next weekend. The meet ends on Labor Day, and then I’ll just be heading over on weekends to watch exercising, as the training track stays open through Nov 15th. Although, I'll be heading back to Saratoga from the beginning of Nov-Feb for my 2nd favorite sport (hockey). My nephew will be playing for the Skidmore College Thoroughbreds this year-gotta LOVE that mascot! Here are a couple of pics from today, to give you a sense of what it’s like. Love the first picture with the buckets all color-coordinated to match the pink flowers in the planters. Great pictures. Thanks again. How far are you from Keeneland, Rachel? Go take pictures. Well, what a day it was at Saratoga! I feel very fortunate to have been able to go on Traver's Day, but it sure was a roller coaster of a ride. The day started out pretty well-it was kind of gloomy, but it had stopped raining. I got a fantastic parking spot, and I was able to sell my extra tickets quickly. Then in the first race, a maiden, my friend’s friend is somehow connected (they were in the paddock) to the horse that won, so that was pretty nice. The crowd was building all day-I’ve never seen so many people there. It made getting photos very difficult. Race 4 was also a maiden, and that’s when Ludicrous had his fatal incident. 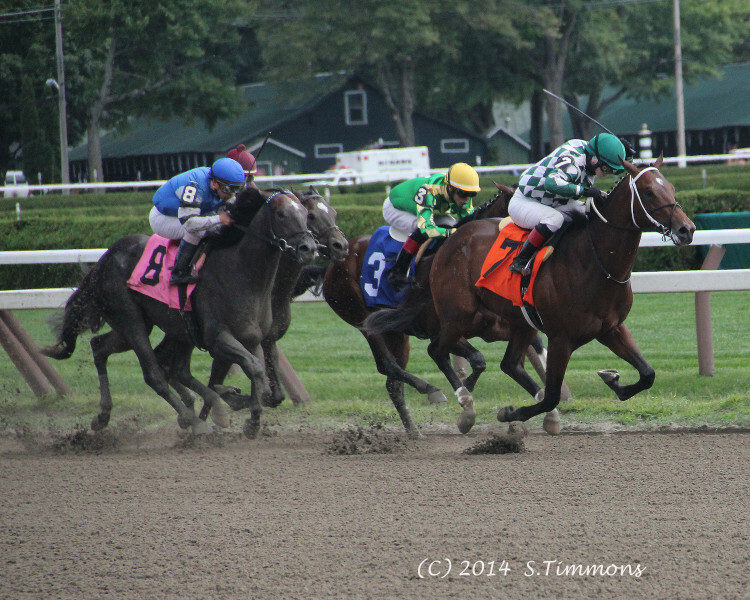 I was photographing them coming down the stretch, then heard a gasp, saw his jockey go flying, and Ludicrous stop. He was facing the grandstand, but was down a bit from where I was. Something didn’t seem right, and then I saw (from his side view) what appeared to be him going down on his front legs-I didn’t wait to see any more & got away as fast as I could in the crowd. I didn’t expect that he would survive, so that put a real damper on the day. The Stakes races were very exciting, The Big Beast won the King’s Bishop, and Artemis Agrotera won the Ballerina, with My Miss Aurelia coming in second. I did get a few photos, but didn’t win any money. I usually do exactas or trifectas, and came close but didn't get to cash any winning tickets. 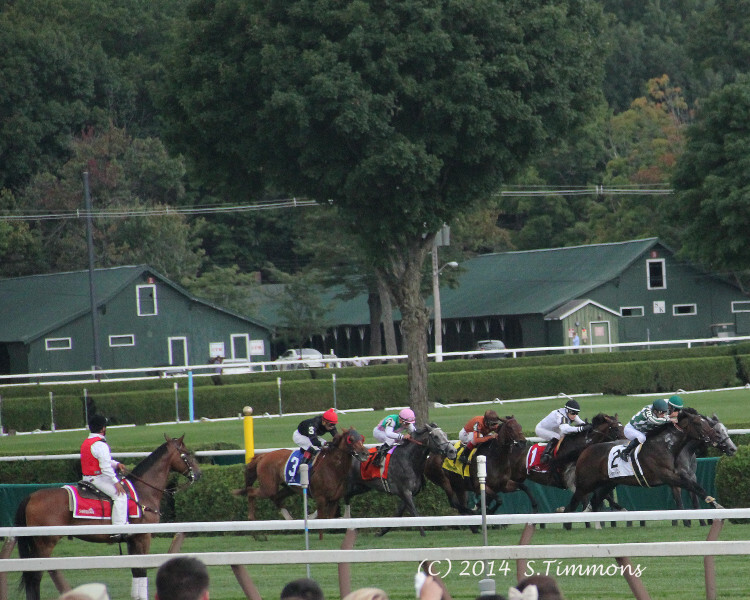 The Traver’s Stakes was VERY exciting as Wicked Strong & V.E. Day battled down to the wire, with V.E Day taking it by a nose. The crowd was roaring all the way down the stretch! I’ll just post a couple of pics for now & download a few more later on. Here is Ludicrous RIP-His jockey has a maroon cap, and he’s alongside #8, seconds before his accident. It was awful-I thought I was going to be sick. I have had only one experience with a death of a horse at a race and that was during a Steeplechase race at Morvin Park. The horse didnt fall over the fence or injure itself in that way. What happened was the cones that mark the path towards the fences was in the way and the horse tripped over it and fell and broke its neck. It went into the death throws (legs flailing and kicking out) the jockey got up after falling from the horse and immediately went over to it to try to keep it down, but he wasnt going anywhere. Horse died right there and they put the dreaded screens up and vanned it off the grass. Was horrible to see, but i could not for the life of me look away. Thankfully, I am able to look away-I know that I have to. If it wasn't early on Traver's Day, I would have left. I've dreaded seeing a breakdown, especially with all the exercising & workouts I've watched lately, in addition to the races. I'm a visual person, and once an image is in my memory, I can't get rid of it. I even force myself to look away whenever I drive past roadkill, as it will be imprinted in my brain. This is going to stick with me for a long time-I can't help it. It's one of the reasons I stepped back from racing for many years. I know it's a reality, but I just don't handle it well. I'm relieved that It's near the end of the meet. I'm going on a photography tour next Saturday, but I don't know if I'll be going to the races for closing weekend. SallyT, I am visual also, and know what you go through when seeing something catastrophic. After seeing Barbaro, Eight Bells, and Ruffian injured, I was haunted by visual flash backs. I had to leave racing for a long time, and it was Zenyatta that brought me back. It has helped to know that many of the track deaths that I have seen resulted over time in some positive research and steps to improve racing safety. Not all of the deaths were in vain, and there is hope that racing safety and breeding will improve. Saw the Ludicrous accident on replay just after the race was over, and the horses were in very tight company with what appeared to be some bumping going on and lane changes. It appeared to be an accident waiting to happen! I could feel my body tighten, and then what I feared happened in a flash. SallyT, I am visual also, and know what you go through when seeing something catastrophic. After seeing Barbaro, Eight Bells, and Ruffian injured, I was haunted by visual flash backs. I had to leave racing for a long time, and it was Zenyatta that brought me back. So, sorry you had to see this live. I wonder if the jocks may have had a hand in this accident. One thing that I have learned to do when I have images that are not positive is to tell myself that I am not to blame for the catastrophe, and I have done the best I can. You are doing lots of positive things for the Z family, and are having fun doing it. Tell yourself that you are not responsible for this accident, and send yourself some positive visual information/thoughts. It helps me to give myself positive feed back, and this helps me heal from bad experiences. When I use a continuous shutter setting for action shots, my lens kept focusing on the spectators, because I couldn't shoot over them. The little kid on her father's shoulders is very cute-but between people & their raised iphones, it really took a toll on my photos. Oh well! I did what I could. The lines were amazing from the betting windows, & food, to the restrooms. I have never, ever, seen a double snaking line to a men's room before! (They were all drinking beer, so their line was even longer than the ladies ! ) As such, I had to be strategic about when I did anything! By the 9th race, I couldn't get to the rail at ALL! The crowd was at least 4 + deep, and I'm short. By the 12th race (Traver's) it was 20 ft deep at the rail. So I had to change up and focus on the horse path for individual shots, as even the paddock was an absolute mob scene. It also took MUCH longer to get from place to place. Louise, Thanks for your kind words. I know it didn't have anything to do with me, I just wish that the race I missed due to logistics was the 4th race! Thank goodness I didn't catch it on my camera by accident. On a lighter note, I'm posting a photo of the top of the stretch in a turf race (I think it's the Ballerina Stakes) You can see the outrider in the lower left corner. I don't have a pic of the outrider in the Traver's, but you can see his location. In the Traver's, as Wicked Strong was leading the way down the stretch, the outrider sat still as a statue while they were passing, but once they passed, he was pumping his arm and cheering them on as much as anyone else! I never saw that before. I thought I had a photo of him doing it, but you'll just have to use your imagination. It made me smile. its unsettling to me that Chad Brown is saying that breakdowns are rare in the thoroughbred industry. Is he trying to cover the truth up or does he really not know how many horses have died this past year? Let alone at Saratoga since the meet started. But its true, the good of this sport is what keeps me in it despite the injuries and death. I know for a fact these horses are being well taken care of and I also know for a fact that there are bad apples in the industry as well. This year, in October, I might be going back to Morvin Park to watch the Steeplechase races. I have not been there since that fateful day of that horse dying. I havent stayed away because of that though, its just cuz of life lol other things happening that have kept me away.